Ironstone Attending a church sale, I was surprised to find two pieces of Ironstone priced very reasonalbly. Happy Monday to you all. Hope your weekend was enjoyable. We have been continuously blessed here in Wisconsin, with unseasonably lovely weather. It’s always a hope each year to prolong winter as much as possible due to its sometimes unbearable weather. As you can tell, I’m not much of a fan of winter but it can be tolerated much easier with the sun shining. Winter is also hibernation time for me not only because of the weather but garage sales have stopped and my major painting projects have taken a break. You can only imagine how giddy I was when I discovered a church sale was scheduled and I would be able to do a little treasure hunting. Continue reading to find out what Friday Finds I scored. Let me just start by saying, I love white ironstone. My fondness to white dishes goes back to memories of spending time at my Aunt’s home and the beautiful table she would set using her white dishes. Luckily, she gifted them to me when she downsized and I smile every time I use them for a large gathering. Because they are white, I can compliment them with the few pieces of ironstone I own. 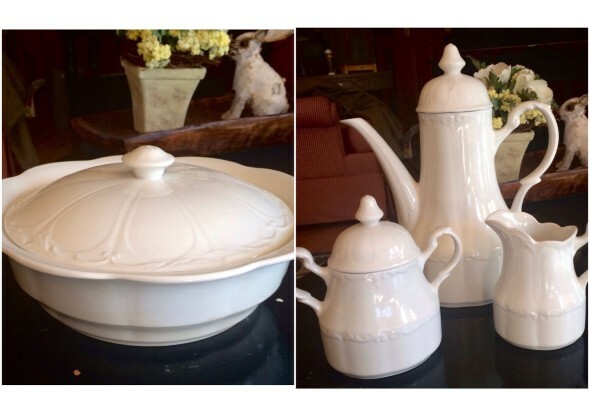 All my ironstone has been a “thifty find” from sales at great prices. 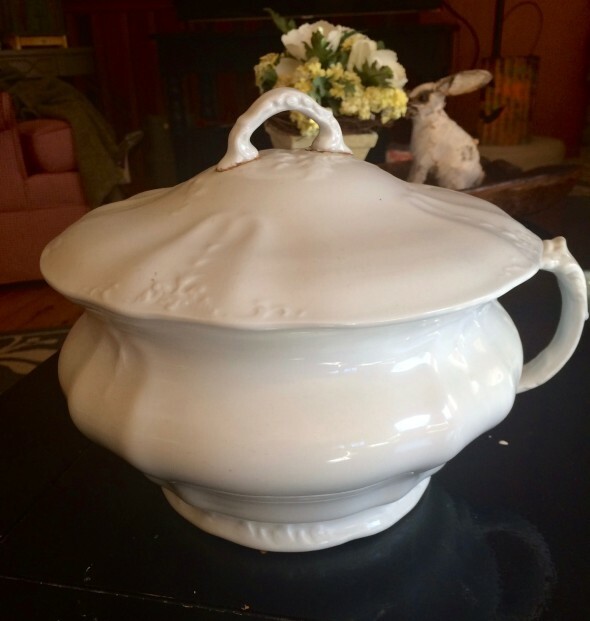 The first piece I acquired was a beautiful white chamber pot I found at a garage sale for $5 . Crazy I know. It was in excellent condition. You can bet I scooped that up immediately. That experience sparked my love for ironstone. My most recent score happened at the church sale I spoke of earlier. Among the tables of kitchenware was a white covered serving dish. When I picked it up for further inspection, I was delighted to find it was ironstone and marked at $4. Yay! Walking on a little further, I came upon an ironstone tea serving set for $7. I was so happy. There was no hesitation on purchasing them. This sale was a success! 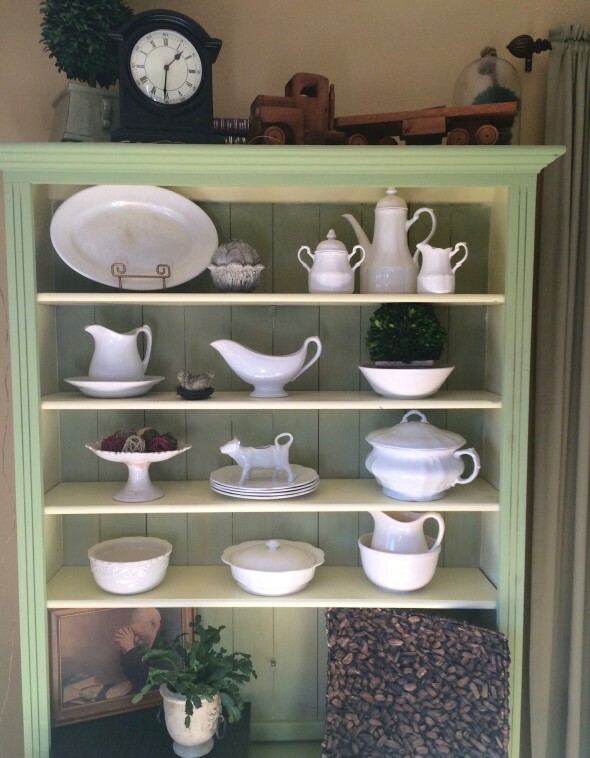 For right now, I have them displayed on a shelf in my dining room among my white ironstone and non-ironstone pieces. It is a great addition! Oops! I was really excited about your find…excuse my typos! Where have I been, I have never heard of white ironstone. It looks so beautiful and elegant. Thanks, Carlee. I love to look at them too. These are SO gorgeous! I must admit, I’m a bit covetous LOL So fresh and clean and elegant! Kristen, I love the beauty of its simpicilty. Thanks for commenting. You are right, they are versatile. The easier the better for me. I love all of your white ironstone. Gosh, now I want to collect it. 🙂 I have a few milk glass vases, lamps, etc. I love white. You can use it all year long and mix and match it with other dishes. White is the way to go. Share some picts if you find some pieces.